We provide a lighting upgrade service for commercial and industrial work places. We upgrade your old inefficient high bay lights, fluoro tubes and low voltage downlights for high-efficiency LED fittings under the VEET Scheme – mostly at no charge. Contact us now to see if you are eligible. Lighting contributes significantly to business energy use and operating costs. Increasing energy prices highlight the need to reduce the cost of lighting. Energy use associated with lighting systems can be reduced by up to 82 per cent if energy efficient lighting practices are adopted. Efficient lighting systems not only reduce energy consumption but improve the working environment, increase safety and enhance staff well-being. High Bay Exchange specializes in all warehouse, industrial, factory and retail space lighting. With our energy efficient LED High Bay Lights, fluoro tubes and downlights you can make significant savings on your energy bill. If your business involves large open spaces for warehousing or manufacturing, then upgrading to quality energy efficient lighting will be of particular benefit. You will save up to 80% of your lighting costs and substantial amounts on maintenance. Most warehouse spaces use high bay lights which typically use Mercury vapour or metal halide lamps of around 250-400W each. If you have lamps like these in your warehouse you can potentially save up to 80% of their energy costs by replacing them with 96-120 watt energy efficient equivalents. Correct wattage of the replacement lamp depends on the existing ceiling height and required light levels in the area. 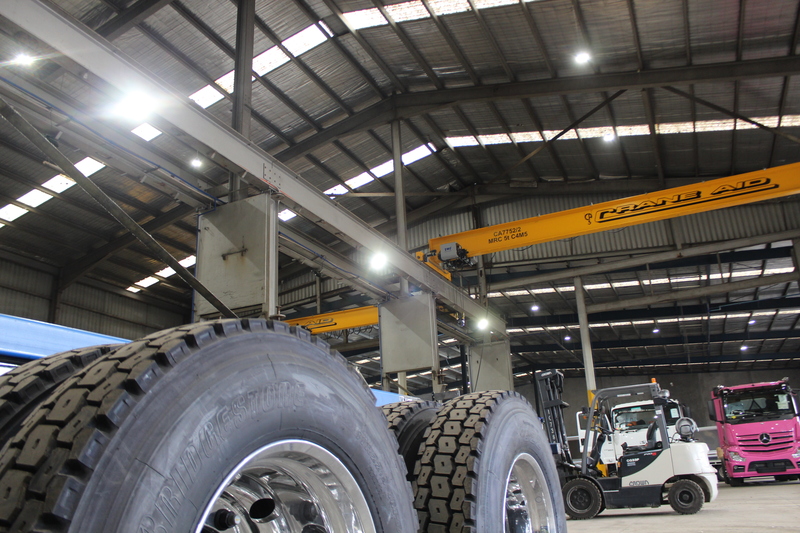 Larger wattage LED high bay lights are available. RETURN ON INVESTMENT – WHAT’S REALLY POSSIBLE? Is it really possible to achieve a worthwhile return on investment? The short answer is YES. Your hours of operation: longer hours = faster return. The level of Government incentive (varies by state and by business type). You shouldn’t blow your budget on your energy bills. You can trust the team at Highbay Exchange to provide a solution to your high lighting costs. We have the experience to provide you with an effective and efficient lighting upgrade where we supply and install energy efficient LED lighting into your work space. Speak to us today to arrange a no-obligation site assessment for your warehouse / factory / showroom / retail space LED lighting upgrade. “Dealing with Mark Naumann from Highbay Exchange was a very pleasant experience as he always did what he said he would do – that is organise the whole project to our complete satisfaction. The lights were installed professionally by all concerned with minimal disruption & followed up with good after sales service. “Just a quick note of thanks. It was a seamless change over for the office lighting, emergency lighting and workshop high bays (including the additional light over the store area). People on time, quickly and efficiently removed and installed with very little to no disruption to the office or workshop during the whole process. Communication was constant leading up to the changeover, this helped to ensure that the workshop was placing items that would least impact the installation and moving of equipment. Again many thanks for your assistance. Leaders in LED Lighting upgrades in Victoria using the VEET Scheme to pay for your install either in full or part subsidy.